Might take a while, but totally worth it !!! Sorry to anyone I might have frustrated...... really!!! sorry! Today I remade a lovely pattern I designed a long time ago. It looks as if it could be difficult or have a ton of pieces, but NO, this one is actually not that bad. The block measures 16" (40.5 cm) and is on the Intermediate Level. This block is available in my Craftsy shop. Thank you so much for sharing! I love your blog, and patterns, and yes, sometimes it may be difficult to understand a paper piecing pattern! It is hard to believe you have only been designing for that short of a time...your patterns are lovely, and a lot more detailed than many others who have been designing much longer. It is very refreshing to find pp patterns that are more artistic and less cartoon-ish! Looks great but I don't have an idea what to use it for. Thank you for adding more instructions. I particularly appreciate that you have added the glue edge to your pieces that span two pages. I was sometimes unsure if I was lining them up at the appropriate spot; but I've always come back to your patterns. 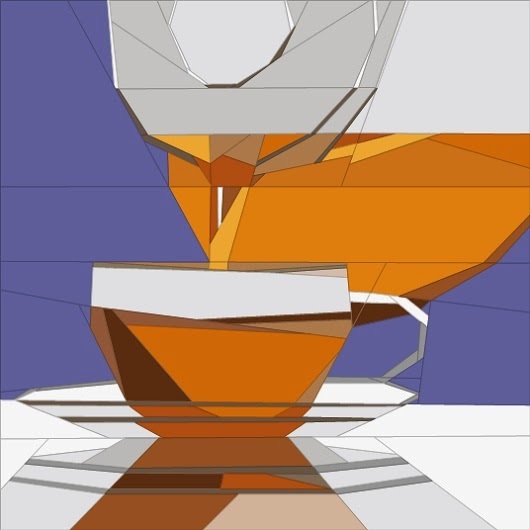 I love the perspective on many of them, such as this tea pot block. Love your designs and paper piecing blocks.Thanks for the pattern! Janeen, you have designed an amazing paper pieced tea quilt! Your use of colors and method of simplifying the lines is amazing. I've never been on your blog before, but have to go and see some more of what you do. thank you for sharing your pattern today on Needle and Thread Thursday! Thanks for the free pattern. I think this will make a nice placemat or a mat for the teapot on my table. I am always impressed with how many patterns you come up with and how well they are done. Thanks for the tea pot pattern! I look forward to using it for a potholder. Such a beautiful block! More instructions is always better than not enough, for sure. Your customers will thank you!. Thanks for linking to TGIFF. Yup - I LOVE this pattern. It reminds me of my sisterwho is such a tea lover! !